While sentences begin and end, Walter Benjamin observed, everything else in writing - genre, ideas, allusions, readings, the word themselves - is perpetually "in medias". For Benjamin, digression was a method, and interruption a place for truth. For Carol Jacobs, to read Benjamin is to learn to read. 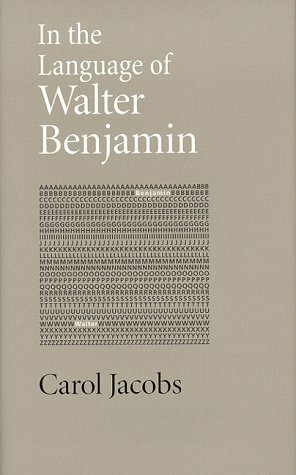 This text collects Carol Jacobs' essays, written over several decades, which attempt to come to terms with the implication of Benjamin's challenging work. His invitations to literary criticism are numerous, Jacobs notes, beyond his own essays on drama, poetry and fiction. He experimented with autobiography ("Moscow Diary") and with history ("Berlin Chronicle") and his "The Task of the Translator" is perhaps one of the most highly regarded essays of the 20th century. In this diversity and insight, Jacobs discerns an approach that lifts reading out of mere communication and into self-conscious interpretation, into an experience of construction and memory.